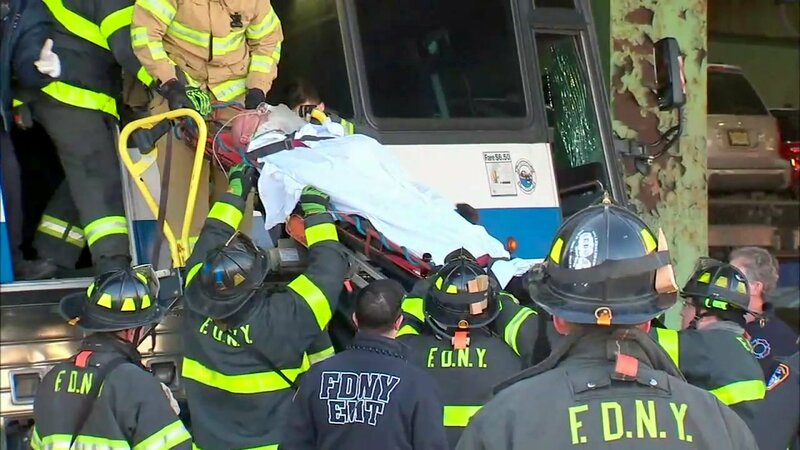 MIDTOWN, Manhattan (WABC) -- Nine people were hurt when an MTA bus crashed into an overpass in Manhattan Monday afternoon. The crash happened just before 4:15 p.m. at 34th Street and FDR Drive in Midtown. The bus struck a pole and concrete divider. The MTA said it was a QM11 bus that was heading north on the FDR and getting off at 34th Street. The driver claims he lost control of the bus and hit the overpass. The FDNY confirmed nine people were injured, and three of them were taken to the hospital. Six others on the bus refused medical treatment. No one sustained life-threatening injuries.